Here at Inside Crochet, we are optimistically looking forward to some sunshine, along with the joys of playing with our children outdoors and some al fresco dining. Nicki Trench has designed an exclusive pattern for us this issue – a beautiful lace motif tablecloth which epitomises an English country garden tea party. Elegant and pretty with a shock of bright colours reflecting spring blooms, this cloth is going to add a touch of refined English rose garden to even my drab patch of concrete! 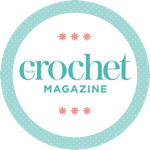 If you want to go all out for crochet in your table decorations, then add a pretty tea cosy, such as Emma Varnam’s on page 77, and our columnist Emma Escott’s jar cosies. These would make excellent tea light, cutlery or condiment holders or the perfect colourful, informal vase – and what a thrifty way to recycle empty jam jars after all those cream teas! Finally, this issue sees the last instalment of our ongoing Mystery Blanket series. It has been a joy to discover what beautiful colours and stitches will come next each issue and while we are sad to see it end, we do have more exciting projects planned for the future. If you have been hooking along with us, don’t forget to send in pictures of your version – we would love to post a gallery of pictures on our website when they are finished.